As mentioned earlier, one of the most exciting things about the new coming 2007 hummel football collection is the development of a 100% new boot, the 8.4 Concept FGX. The boot was designed from the ground-up (or inside out, depending how you want to view it), and features a number of revolutionary new innovations designed encourage the best fit and performance possible. One of these important developments, is the new FGX outsole. Click the Read More link below to learn more about some of the features of the new FGX outsole. Build around a completely new, wide fit, anatomical last, the new FGX outsole was designed foremost to offer the maximum balance of performance in comfort and traction. Featuring a combination of stud shapes, the FGX uses rounded blade studs for grip and control on the majority of the studs. These studs are constructed with a visible dual density TPU column in the center, that helps transfer energy and impact to the internal midsole. To help protect against the traditional concerns of traction blades, ACL injuries, the FGX outsole features a unique pivot point design in the medial forefoot area, with 3 conical studs as typically found on a classic round stud design. This pivot point and use of round studs, help enable good grip and quick direction changes and avoids the problems of over-traction that ocurr sometimes with bladed designs. The result is a safer and more comfortable performance. In addition to these features, the FGX outsole has been designed around a DYNAsymm internal latice chassis. This support grid offers good strength, flexibility and reduced weight. Using a truss-like X beam structure, like a bridge beam construction, a minimum of material can be used to provide great strength. Unlike lightweight carbon fibre, which can have too much spring, and is prone to snaping under extreme loads, the TPU DYNAsymm chassis will evenly flex and bend and responds more like a normal outsole. As well, for top quality durability, the FGX outsole has 4 metal rivets per outsole, including one placed in the medial forefoot, and a custom metal logo rivet in the heel. Most boots have only 1 or two. These rivets help protect against delamination. 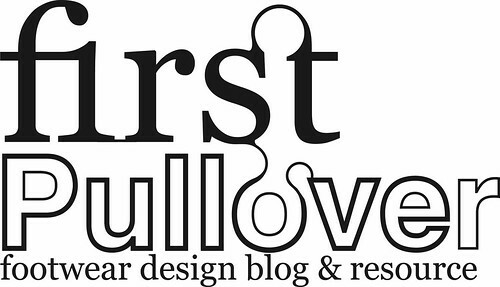 stay tuned for more info and pics coming soon! I'm glad a boot manufacturer has realised the problems with blade type studs in the forefoot region. I have had so many problems with those blade type boots from persistent hamstring injuries of my standing leg to one case where the boot actually sheared in half across the midsole due to the forefoot beeing unable to rotate while I was wearing them. I was beginning to worry that manufacturers were ignorant to the issues of blade studs and just thought they were fashionable. Good work! interesting idea. have to be carefull though to avoid pressure directly on the ball of the foot though, or you could break a metatarsal. Can you explain the studs with the TPU column in the center. How is that put together? 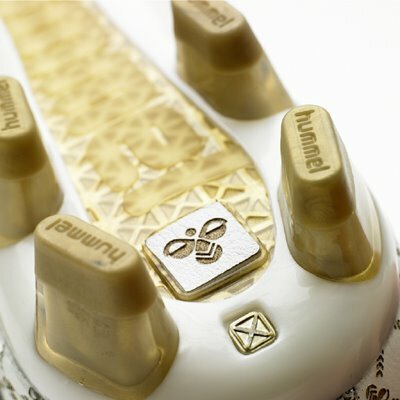 the gold is the cleat plate and is it independent from the white injected tpu or chasis? How do you get that clear to opaque effect on the bottom of the stud? 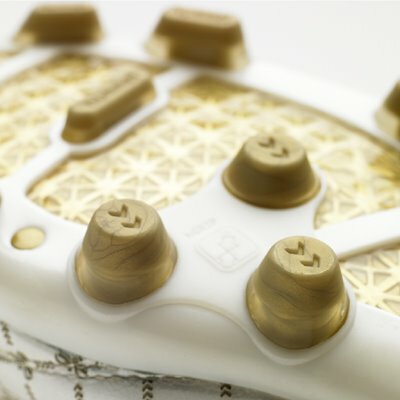 The TPU studs with the column in the centre is as an secondary molding injection of the gold material after the clear and white base materials have been molded. This way, the two parts become physically bonded together and as strong as a single studs, but with the benefits as mentioned of two different material densities. 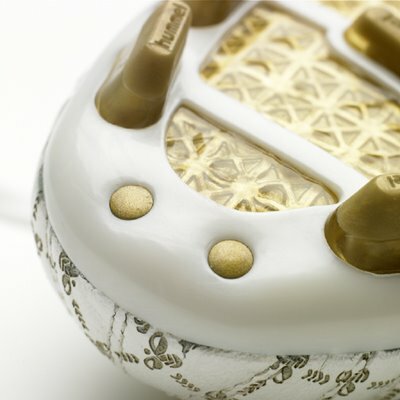 First the white base border is molded, then put into a second mold to do the clear, then put into a third mold to do the gold stud tips and centers. 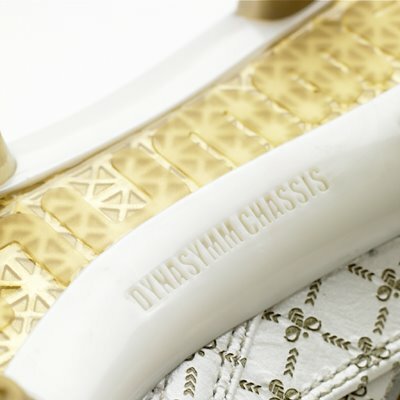 The center DYNAsymm chassis is actually then painted gold from the inside out to reveal the chassis structure. What you are seeing in the "clear to opaque effect" on the studs, is the gold internal molded injection that is both inside in the stud in the center, then become outside to form the stud tips.